Silicone bottle with one teat for liquids and another one shaped like a spoon for solids, with protective cap. The body of the bottle is made of soft silicone that is smooth to the touch. A greater or lesser amount of solid food will be dispensed depending on the pressure applied to the bottle. This means the flow can be manually adjusted. Grows with the baby… Makes the transition from liquids to semi-solids easier. Flexible and soft for the comfort and protection of your baby. It has been specially designed for the transition from liquid food to food with cereals and semi-solid food. Stage 1: Liquid food – Silicone feeding bottle and silicone teat for liquids auitable for the first stage. 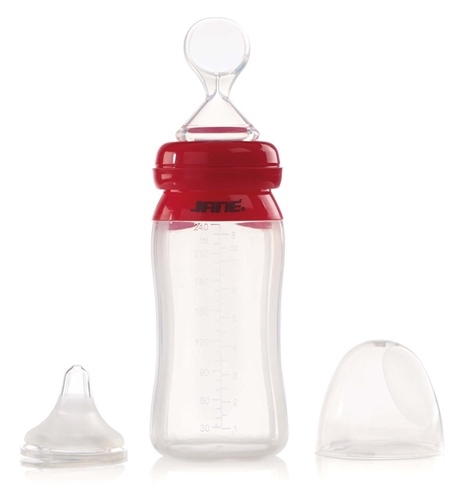 Stage 2: Semi-solid food – Silicone feeding bottle and silicone teat shaped like a spoon specially designed for the cereal and semi-solid stage. The system is easy to clean to use. Teat for solids in the shape of a silicone spoon.